Italy is a country of striking contrasts. The high, isolated mountain villages and beautiful beaches of the fashionable Italian Riviera, as well as the storied variety of Italian art and music, are just part of what makes Italy the diverse delight so many people love. It should come as no surprise to researchers, then, that this same variability carries over into Italian record-keeping. But while the mixed bag that Italy offers is a tourist’s dream, the same variety can be a genealogist’s nightmare. It doesn’t take a researcher long to discover this diversity. When you first begin researching Italian records, you will see this trademark Italian variety in an almost endless assortment of records, each changing format depending on the geographic area and time period. Despite the Italian penchant for the diverse, this muddle of different forms and formats may be more a reflection of Italy’s confusing and tumultuous history than anything else. Italy didn’t become a united country until the 1860s, after hundreds of years of being overrun by different empires, countries, and groups. This is a key time for family researchers, as it makes a big difference in where and what type of records will be found: civil documents before 1865 are in the state archives in each province, and the records afetr 1865 are accessible in each town or commune. 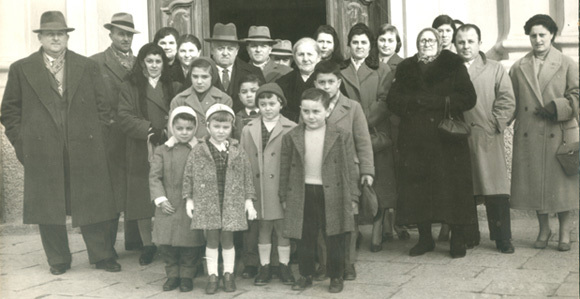 Italy’s civil vital records are often available through the family history centers of The Church of Jesus Christ of Latter Saints. While the LDS church’s involvement has been a great boon to Italian genealogy, few people will find all the records they need in its collection. To complete most searches, a researcher will have to go to the source: Italy. Due to time and financial constraints, many people write to Italian archives, rather than going to Italy, to obtain vital records for their family histories. If you write to Italy for civil vital records created after 1865, you will receive either a “certificate” or an “extract.” The Italian government does not permit vital records to be photo-stated or viewed until they are at least 75 years old. It is to your advantage to request an extract, as it will contain much more data. These extracts will give you much of the information you want, including parents’ names. which are not generally included in a certificate. The extracts are fairly easy to read, even for a beginner, with the use of an Italian genealogical word list or dictionary. The documents which often give genealogist the most problems are those that are referred to as Napoleonic records. When Napoleon took over most of Italy in the beginning of the nineteenth century, the French instituted a system of law which included the recording of civil vital statistics. This system introduced new forms for the recording of births, marriages, and deaths (these forms are similar to the forms used for the registration of these events today). The Napoleonic records begin in about 1806 or later, depending on the area of Italy. Napoleonic records are filled with details to delight genealogists. These records are in Italian, of course, so at least a basic knowledge of the language will help. Without some advance preparation and language background, finding the date you need and the name of the person who is the subject of the record can sometimes be difficult. In southern Italy and Sicily, you will find wonderful printed records that start about 1809 to 1820. The forms in this area of Italy (which are also often called Napoleonic, even though Napoleon never entered Sicily) are fairly uniform, and it is easy to become acquainted with the records and do your research. In the north, however, the records are not as easy to use. Napoleon was in the north of Italy until 1815, and although there are Napoleonic records for this period, the north, which is always thought of being very developed and industrialized, has handwritten records. As genealogists know, this often creates a big problem: deciphering handwriting is a major stumbling block when reading records. While the northern records include much of the same information as is found in the southern records, northern records are much harder to read. It is always difficult to generalize about Italy: for instance, the situation described above does not apply to all of northern Italy. In the Trento area of Italy, after Napoleon left, civil records were kept by each local church parish, in addition to its own parish records. This procedure was continued until the area became part of the Italian Republic. There are also variations in record-keeping found in the Piedmont area. Thus the north presents problems for researchers, as opposed to the south and Sicily, where the vital records are much more uniform. 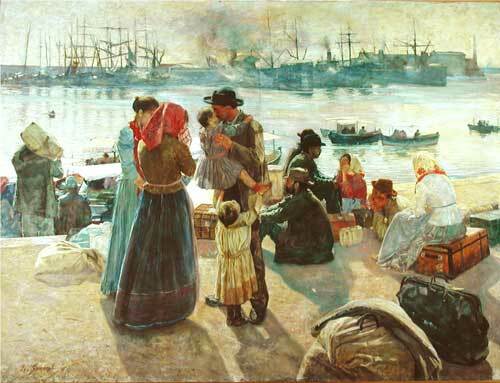 Fortunately, the vast majority of immigrants to the United States came from the south and Sicily. Closer to Home. Italian researchers can access records at Ancestry.com where they can find many records of Italy. Birth records are one of the first items researchers generally seek. Marriage records are similar in form but more detailed. They are certainly more detailed than the ones that are used today in Italy. Marriage in 19th century Italy involved a long process, which included the publishing of banns and the procurement of many official and church documents which had to be presented to the town officials. That the engaged couple were able to do this without the benefit of a photocopier or online methods is amazing. Civil death entries are shorter and contain less information. Also, remember that death records often contain inaccurate information. It helps to remember that the person who would have the best information about the ancestor whose death record you are looking at, is the one who is dead. The details in the death record come from people who may or may not have been close to the deceased. The death entry will generally give you the name of the deceased, his or her age (an estimate), his or her profession, and the names of his or her parents and their ages and professions, as well as the names of two witnesses who came to the town official to report the death. These witnesses may be relatives of the decedent. It is important to note that the names, ages, and professions of the witnesses come first in the death records, and the decedent is named thereafter, along with the time and date of death. Civil records are generally much more informative and reliable than church records in all areas of Italy, but when you go back earlier than 1806, you must rely on church records. Church records vary from place to place. Even in the same town, records will vary, as you proceed back in time, as to readability and the amount of information they contain. Sometimes death records and marriage records contain only the name of the deceased or of the marriage couple, with no other identifying information concerning that person or persons. As you can guess, once you have gone back to the 18th century and beyond, research becomes much more difficult. With that in mind, it’s best to concentrate on civil vital records first in doing your family history research. When you have exhausted that venue, begin consulting church records. Miscellaneous. There are certain points to remember when researching civil vital record forms. The first date written at the top of the document is the date of entry in the town’s records, not the date of the event. Remember to check many records, not just the ones of interest to you, when researching in the records of your town. When using microfilm, become familiar with the records in general and with the style of the record-keeper. The person who made the entries sometimes did so for many years. If that is the case, this person not only had a specific handwriting, but also tended to have a certain style and vocabulary. I have often been asked to study and translate certain obscure words in a document, only to find that the registrar making the entry liked to use words in his entries which were of no particular importance, but which certainly bedevil the researcher. Answers to such questions come to light only when records for an entire period of time in a town are checked and a pattern is discerned. Although they are often difficult to understand, Italian civil records can be a wonderful resource which offer satisfying results to the interested family researcher, whether he or she is a beginner or an expert. Match.com is considered one of the most trusted and reliable dating sites on the Internet serving more than 24 countries including Italy.